Studies show that when you make purchases from independent, locally-owned businesses, such as LaCava Auto Parts in Fall River, there are many benefits for you and your local community. For you, the consumer, buying local Fall River car parts and accessories provides you with better services and more success with the parts, tools, products, and accessories that you purchase. Our team of highly trained and experienced employees are happy to help you find the items that you need at our local store and, if we don’t have what you need in stock, we will order it for you and even deliver in the Greater Fall River area. When it comes to the community benefits, the more consumers that support family-owned and operated small businesses in Southeastern Massachusetts, the stronger our local economy will get. Instead of outsourcing our services and purchases to web-based outlets that are thousands of miles away, keeping our business here in the Greater Fall River and New Bedford area helps to increase opportunities for everyone who lives here. Local shop owners, service providers, farms, and other industries are all part of the economy that we depend on for our own livelihood and quality of living. Most of the local businesses that you find in the Greater Fall River area, including LaCava Auto Supply & Services, are owned by your friends and neighbors who also live in the community. This means that a family-owned business is much less likely to leave and is therefore more apt to invest in the future of the community as well. 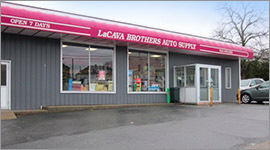 For example, LaCava Brothers have provided quality professional services and sales of auto supply in Fall River for over 70 years. Our family is a proud part of the local community, and we work hard to ensure that we offer the best possible services to our customers. In addition to serving consumers like you, we also provide sales of Fall River car parts and accessories to professional auto mechanics and businesses that offer automotive services. While we are known as the shop “where the pros buy their parts,” we are proud to also extend our great prices and industry know-how to individual consumers for DIY repairs and restoration projects. 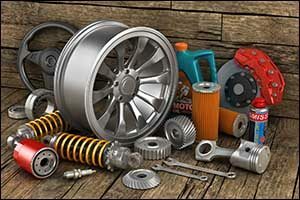 We carry a large inventory of parts and accessories for everything from basic tune-ups to complete overhauls. Our online Parts Lookup tool can be used to search our inventory or to order any parts you need to complete your project. If you have not visited our store to shop for parts, products, fluids, tools, and accessories, come by our store on Bedford Street in Fall River to see our stock for yourself. We have a newly expanded Car Care Department that features a full line of car chemicals, fluids, and products to help you keep your vehicle looking it’s very best. Our large selection of automotive accessories and a vast inventory of tools can help you to get your vehicle in great shape and prepare you for any eventuality. We specialize in automotive tools and feature top quality Wilmar products. We offer FREE delivery in the Greater Fall River area and can ship hard-to-find parts to your door. Family-owned and operated since 1942, you can trust LaCava Auto Supply & Services to have your back and provide you with everything you need to succeed. We serve businesses, commercial, and personal accounts, offering a full line of both foreign and domestic parts. We work with all the major brands, including Monroe brakes, shocks and struts, Wagner brakes, Walker exhaust, Delphi fuel pumps, Moog chassis, and much more. Our knowledgeable staff is waiting to assist you with all of your automotive needs. Stop by and meet with our staff in-person or give us a call at 508-676-1951 to get all of your Greater Fall River car parts and accessories. We can answer any questions that you might have about our auto supply in Fall River, offer insight into the professional services that we offer, and help you find the parts that you need. Call today or stop by – LaCava Auto Parts can help you with any project, large or small!